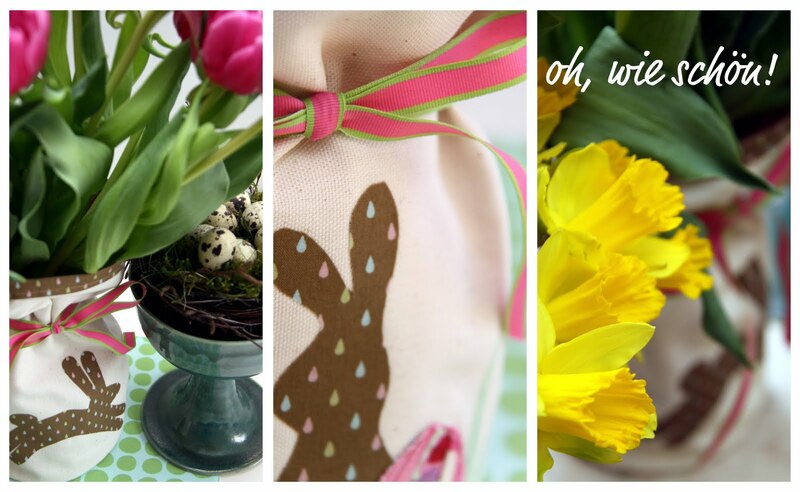 So, I guess I had a few plain flower vases lying around and decided to spruce them up a bit for my Easter table. This is not necessarily a tutorial that is anything "new", but if you've never made a simple bag with a round bottom, this could be helpful.... again, I'll show you how to get started and you take the creativity from there. 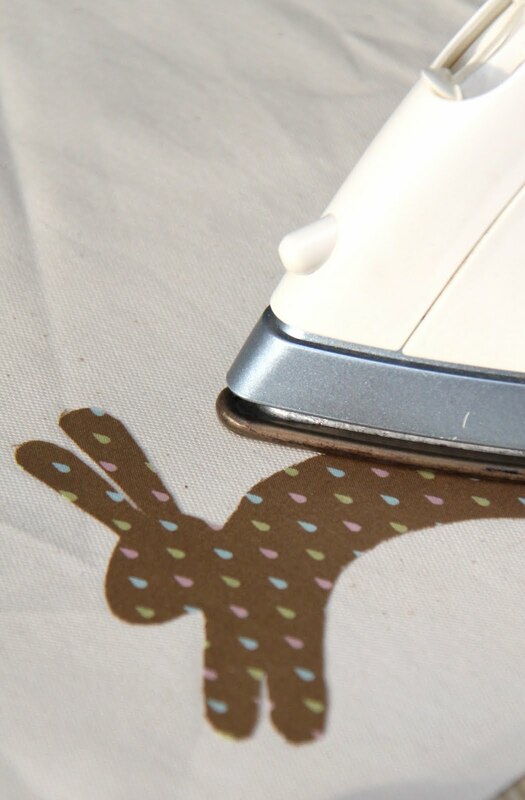 Using a double-sided interfacing, cut out the shape that you would like to apply to your bag and iron it in place. For the outer fabric I used a simple heavier weight cotton muslin (ca. 10.5 x 15.5 inches, 26.5 x 39.5 cm). I used both the "Hippity-Hop" and the "Hippity-Hop Friends" patterns. 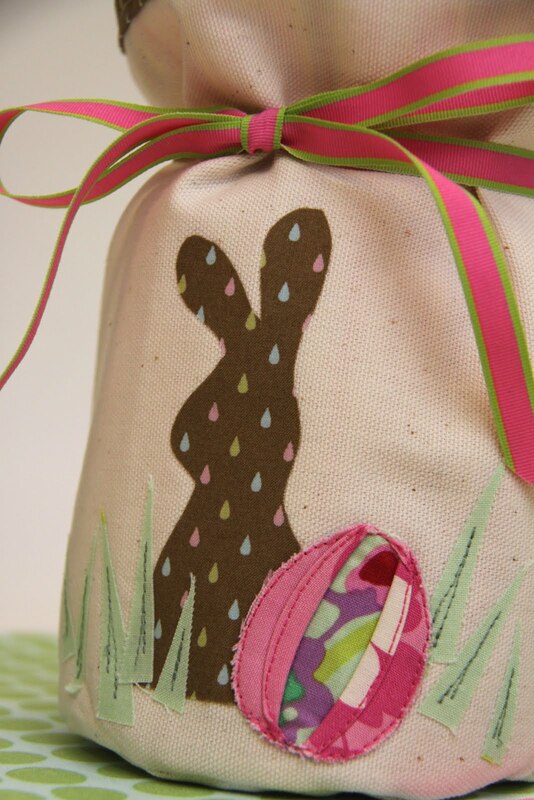 With the "Hippity Hop" pattern, I simply reduced it down and added a few "extras"(like a miniature version of the "Easter Deco" pattern). 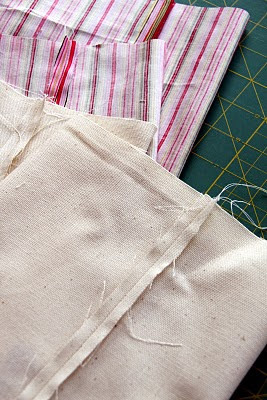 Select a lining fabric for your bag and cut two rectangles the same size for the lining fabrics. 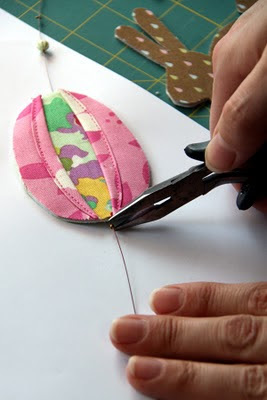 Fold the fabric in half and stitch along the short edge of the fabric to create a tube. Iron seam open. Cut a circle (ca. 5 inches, 13 cm in diameter) and fold it in half. Mark the fold line on both ends. Fold circle again so the marks match each other and mark the new fold lines on the circle. (you should have four marks) For the bag (tube), fold in half using the seam as one folded edge and mark on the folded edge. 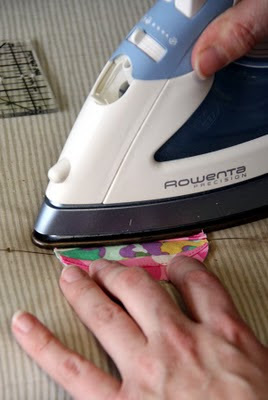 Open the bag, match the marks, fold in half again and mark the folded line on the opposite sides. Match the markings on the bag to the markings on your circle. Pin the four marked notches first and then pin the rest of the circle in place easing the fabric in as you go. Stitch around the circle. Once you have stitched all the way around, cut several notches in the fabric towards the seam, being careful not to cut through the seam. This is very important when sewing curves to make sure that the fabric lies correctly without bunching up. Iron seams. Repeat steps for second bag and lining. To create a band, cut a coordinating fabric in a long strip (ca. 2 x 16.5 inches, 5 x 42 cm) Fold each edge the same distance towards the center and iron. 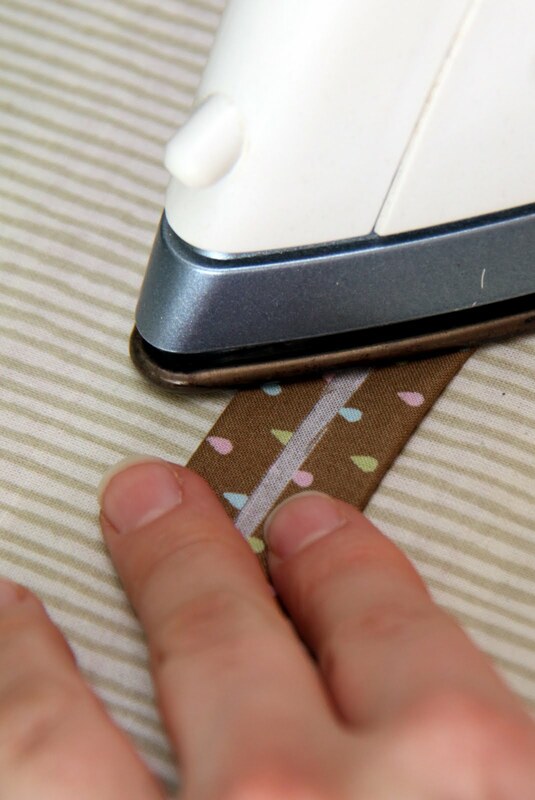 Fold the strip in half again and iron. Place the finished lining inside the finished bag wrong sides together. Open the band you just made and sandwich bag in between the band to create a finished edge. Pin in place and continue around the bag until you come to the end. 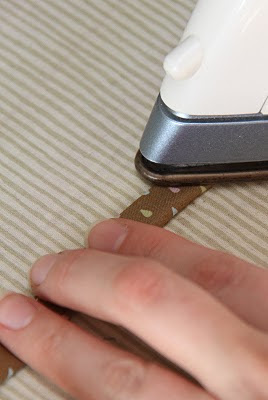 Fold the fabric back so you have a finished edge and pin in place. 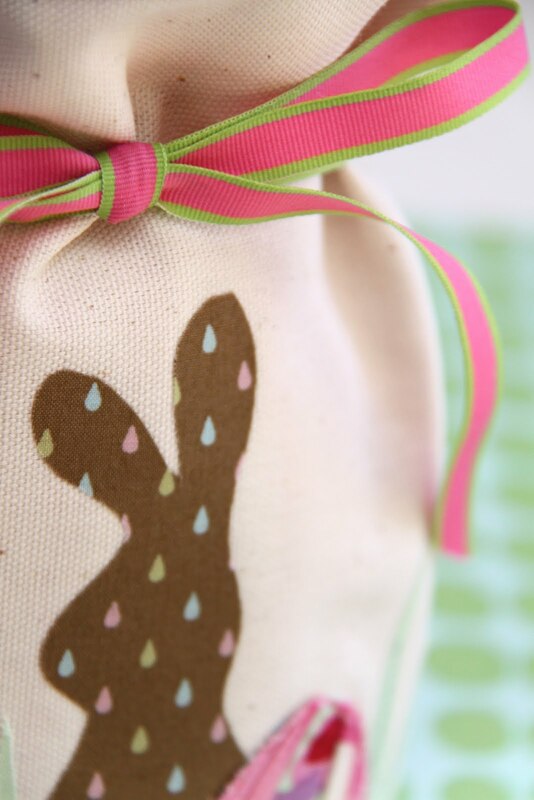 Stitch around the top of the band in a coordinating thread and you couldn't have an easier way to decorate a boring vase or make a bottle of wine a special "Easter" present. 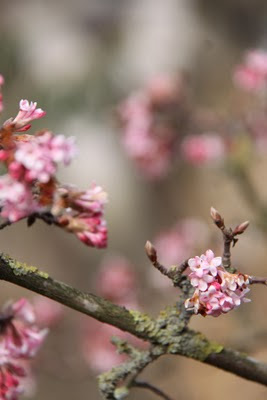 It's no secret that we are now in the month that I would call my favorite time of the year... that season where one can see the beginnings of new life, the days don't seem as short and gray as they once were, and one's soul is filled with the anticipation of what is yet to come. 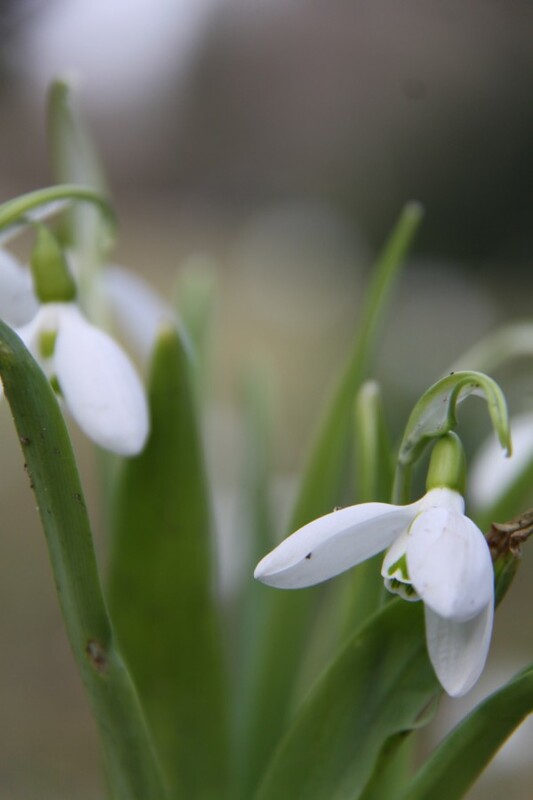 I love to capture the beauty in the things that have not yet fully "sprung"... nature's subtle wonders without the bright painted colors of summer. That first little pop of spring, in what I find to be the prettiest and freshest shade of green there is. But other than the new life that came to us in the month of March, there is something else that makes this month special for me. 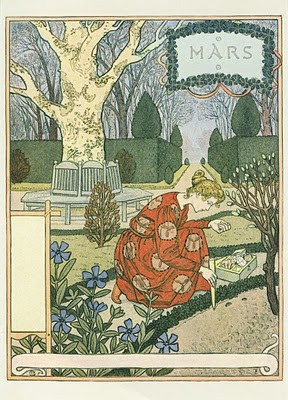 No matter what time of year it is, everyone enjoys cards with good wishes and congratulations, carefully wrapped presents, telephone calls from friends and family chiming "Herzlichen Glückwunsch, Alles Gute zum...", and surprises... oder? So, do you have any weekend projects planned? 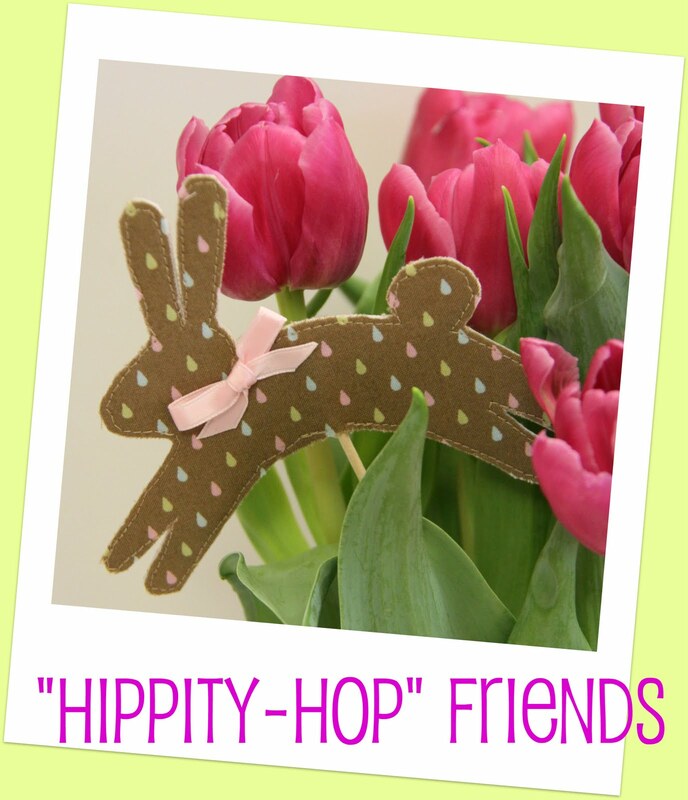 As promised I thought I'd pass on a couple ideas using the "Hippity-Hop" Friends pattern. Wouldn't this fabric also make a sweet matching skirt? 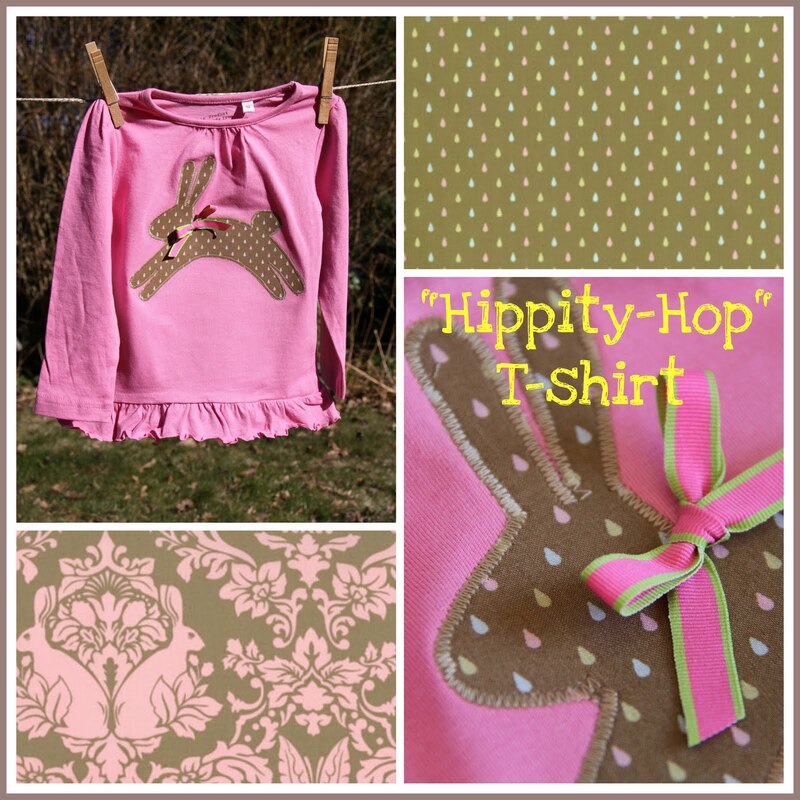 From Tula Pink's Hushabye collection. 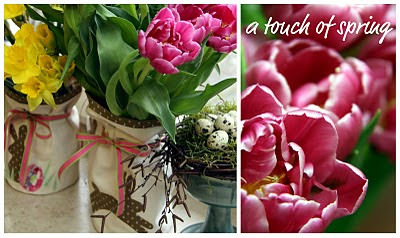 It seems as if I've been stuck on "Easter Deco" projects, but this time with a little different application. 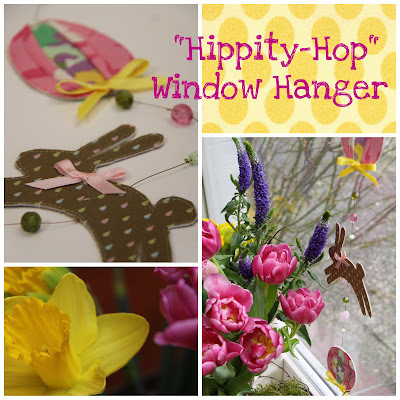 I really love to combine different mediums and why not combine sewing with jewelry making for a "Hippity-Hop" Friends window hanger... could there be anything better than to combine two things you love?!? 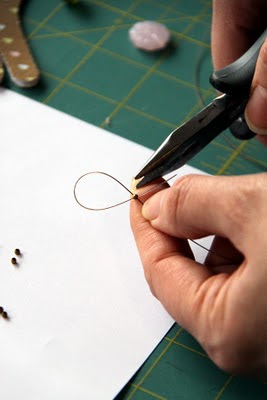 Cut the length of your stringing wire as desired. 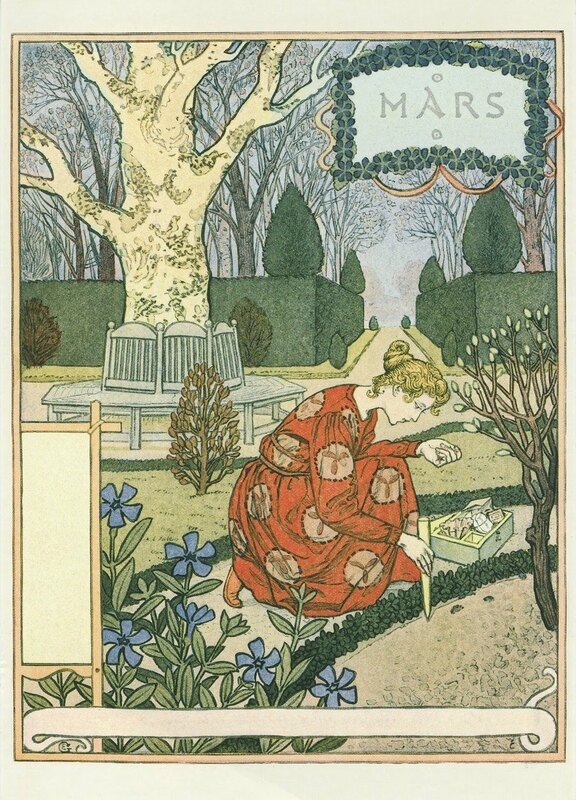 I would suggest to cut a little extra and trim later as needed... better to end up too long than too short. Make a loop at the top for the hanger. 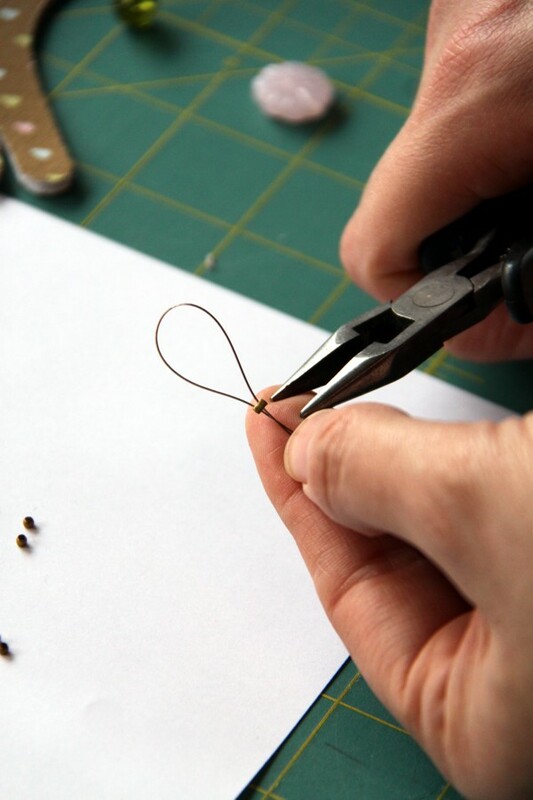 String a crimp bead and using your flat head pliers, crimp the bead flat so the loop is held in place. 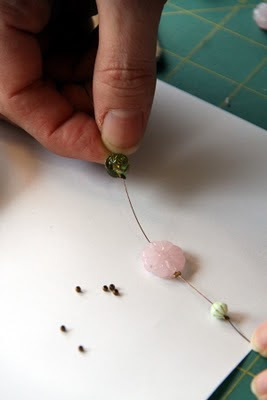 String a bead on the jewelry wire and then followed by a crimp bead. Crimp the bead and your bead will stay in place. Continue stringing desired beads in place and crimp after each one. 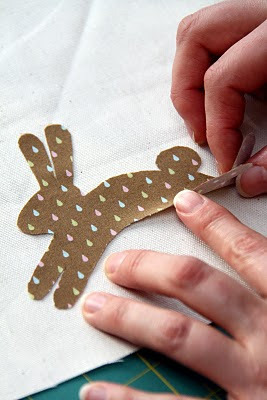 Using the same technique from the "Easter Deco" tutorial, cut out desired shape (here I used the easter egg and the small "Hippity Hop" friend). Sandwich the wire in between your shape and iron in place *NOTE: be very careful when you iron that you do not get too close to your wire. Many jewelry wires have a coating on them and could melt if exposed to high heat. 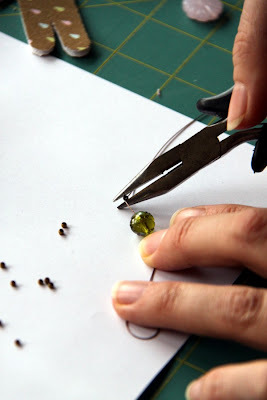 Add a crimp bead after your fabric shape, just like after the beads, and crimp in place. Continue beading and fabric shapes until you have reached your desired length. 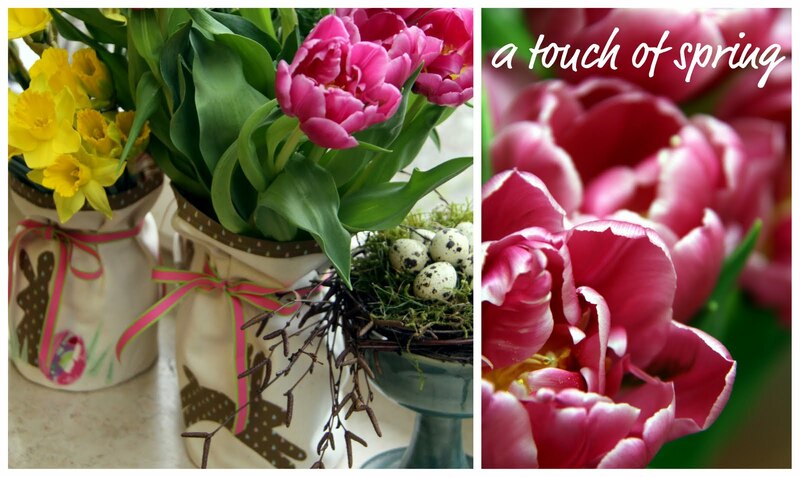 Find a lonely window, door, wall or wherever that needs a little decoration and hang. There you have it... So easy, so fun. Happy weekend creating! I really appreciate every comment that I get and I especially love to hear what you think. I have a one year old "little man" that sometimes keeps me from dropping by and telling you all so, but just so you know... I'm thinking it! I habe mich wirklich sehr über jeden Kommentar gefreut und besonders über Eure Anregungen. Da ich einen einjährigen "kleinen Mann" habe komme ich nicht immer dazu, Euch dies direkt zu sagen - aber seid gewiss, dass ich es in Gedanken tue! PS: Übrigens fand ich es besonders toll, so viele Kommentare auf Deutsch zu bekommen! Bitte macht weiter so! 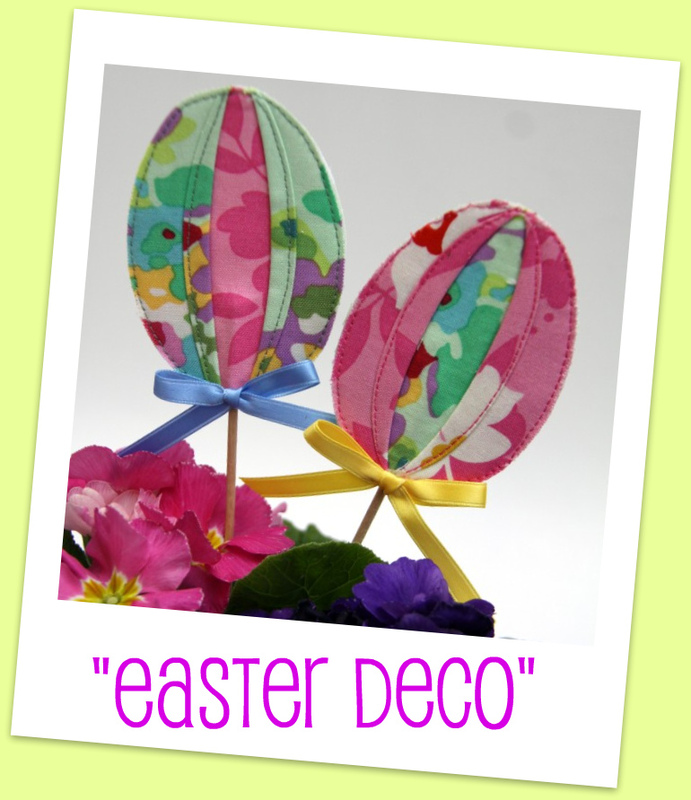 I used the same technique as with the "Easter Deco" eggs to make this adorable "Blumenstecker" (flower pick) I've worked up a few more projects with this little guy and you can find him here... I'm really on a roll and I'll be sharing a couple more Easter projects coming soon! Just in case you happened to have missed it, you still have time to enter the "I'm 100!" 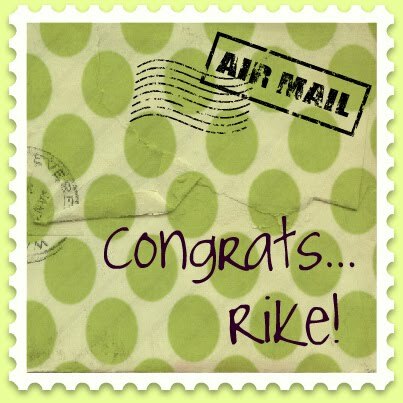 Gewinnspiel/Giveaway... but you only have until tomorrow, March 15th! we made one giant place in our hearts for the tiniest of ones... and we told him that he would have it forever. 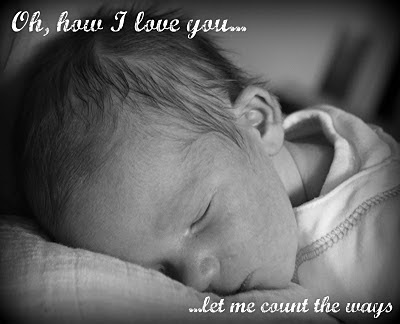 a sweet little boy decided that he wanted us... and we said yes. 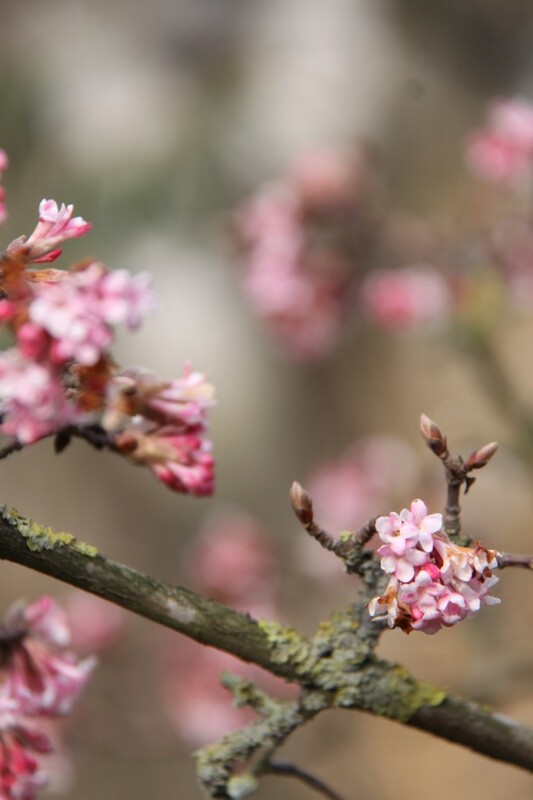 ... and like the flowers that begin to appear in this season, what started as a very small and very tiny thing, has quietly blossomed into a love each day, bigger than it was the day before. ... Happy Birthday, Sweet Pea! Ich freue mich sehr, dass so viele von Euch einen Kommentar auf Deutsch hinterlassen haben und hoffe, dass es weiter geht! Ist doch klar, dass ich es verstehen kann, oder? Mein Mann hat keine Lust, alle meine Posts zu korrigieren... Deshalb ist meine Anleitung wie immer auf English, aber Ihr kommt ja gut klar, denke ich. Viel Spaß beim Nähen! Using your fingers, curl the edges of the top layer fabric back so it looks like a half crescent moon so you can see the underneath fabric. Iron in place. 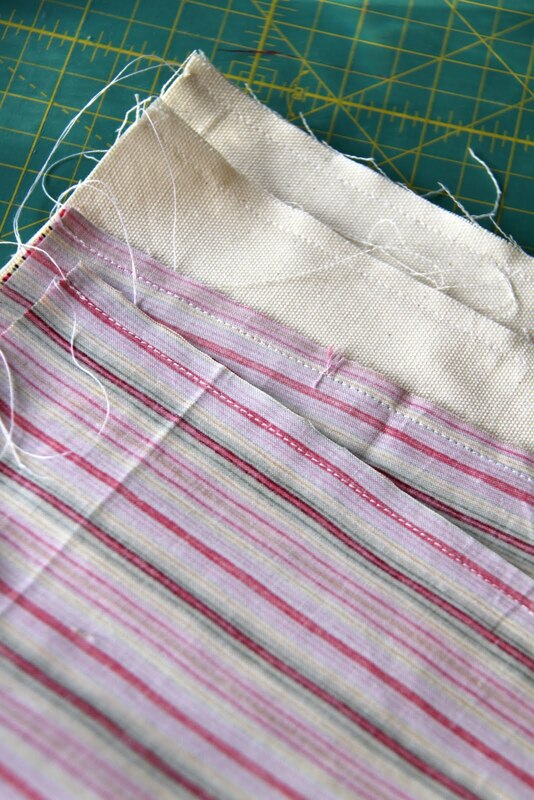 Usining a coordinating thread, sew down the pulled back top fabric. Do this on both sides. On paper, trace the shape of an egg just slightly smaller than your square. Center it on your sewn square and use it as a template and cut arround it. 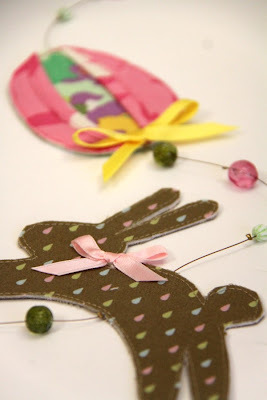 Place the egg on a double sided interfacing (z.B. Vliesofix) and cut around it. Choose a solid color, or other coodinating fabric for the back and reinforce it with a heavier weight interfacing as with the first fabric. Use your pattern template to cut it in the shape of an egg and lay it on the back side of the egg with the double sided interfacing in the middle. Place a craft stick, or a wooden grilling stick in between the layers and iron so the front and back adhere to each other with the stick sandwiched in between. 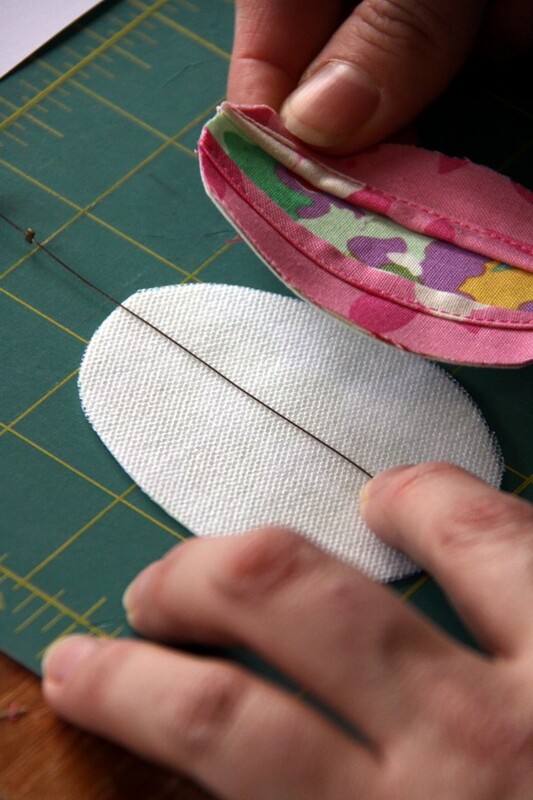 Stitch the egg as close to the edge as possible and trim excess threads. 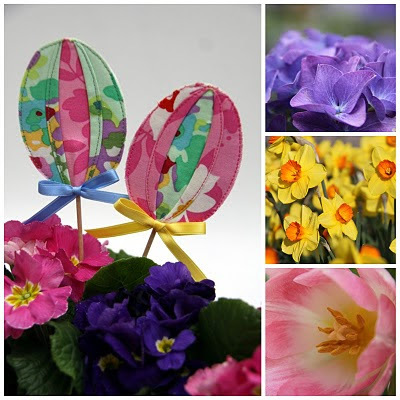 Add trims, ribbons, or decorations as desired, and stick in a beautiful basket of spring flowers or arrangement and you have a sweet Easter "Mitbringsel"!